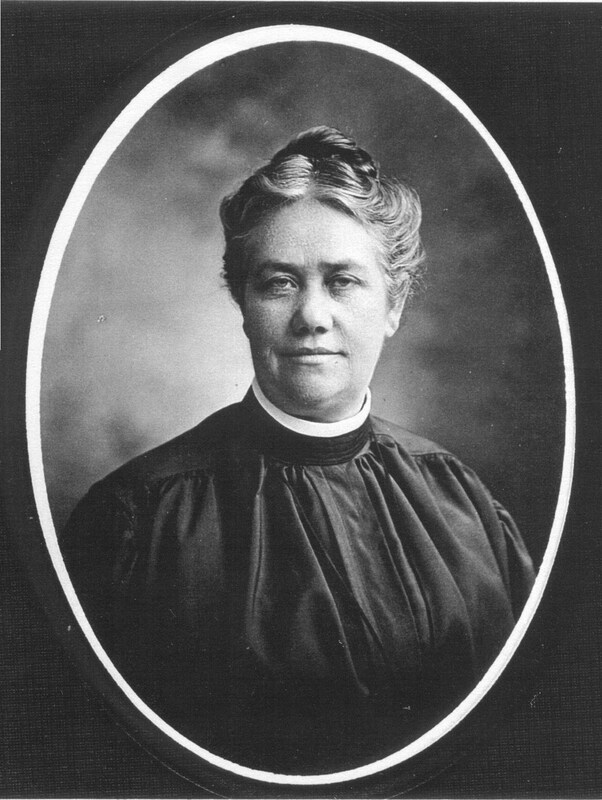 Alma Bridwell White (June 16, 1862 – June 26, 1946) was the founder, and a Bishop, in the Pillar of Fire Church. The Rocky Mountain Pillar of Fire; December 19, 1906; By Alma Bridwell White; There never was a time in the history of the world when the devil had so many devices to deceive people as now. He does not come so much as a roaring lion, but as an angel of light, and before people are aware, he has caught them in a snare which means their sure destruction if a miracle is not wrought to disentangle them from its meshes. As we are nearing the winding up of the Gentile age he seems to become more desperate and more determined to destroy the whole human race. Everywhere people are under his delusions and so deceived, that it seems utterly useless to try to open their blinded eyes. Well may it be said, “Woe to the inhabiters of the earth and of the sea! for the devil is come down unto you, having great wrath, because he knoweth that he hath but a short time.” In the dark ages he was bloodthirsty and vicious, torturing in every conceivable way the saints of God. Now he more often appears in a different guise; taking for his covering the thirteenth chapter of First Corinthians. The so-called “gift of tongues” that is becoming so popular now with hypocritical professors, is one of his latest delusions. Paul says, “Though I speak with the tongues of men and of angels, and have not charity (love), I am become as sounding brass, or a tinkling cymbal.” The devil is smart enough to accompany this counterfeit of tongues by a spurious love, robing the tongue victims in a slimy coat which he passes for divine love. A few days ago a person whom we knew before he became connected with the tongue heresy called at the Pillar of Fire office. Outwardly he seemed to be altogether changed from the man that we had once known him to be. He claimed to be speaking in tongues and gave a vivid description of how four different times he was knocked down and stretched out under what he called the power of the Holy Ghost. We were surprised that the devil would have boldness enough to even attempt to demonstrate his power and pass it off as genuine in a place like this. The man claimed that when he received his Pentecost in the “tongues” meetings, with it came a great baptism of divine love, such as he had never known before. The Lord permitted the writer and others to sound the depths of this so-called love, which he was doing all in his power to demonstrate, and we found it to be only a gilded coat of slime on the surface. This man who once fearlessly denounced sin and reined up law-breakers, now says, “Just leave them with the Lord, let Him make wrongs right, tell the people about the precious love of Jesus.” When told of persons who had failed to confess their sins and make restitution before having received the “tongues” baptism, he said, “Such persons surely need the baptism of the Holy Ghost,” and he did not doubt but that they had received it even after we had pointed out to him their unconfessed sins. His doctrine is simply revolting to anyone who has any appreciation of truth and integrity. He claimed the Lord was paying his railroad and other expenses; he was then on his way South to hold a meeting. He said, “Get people converted.” We wondered from what, as he no longer denounced sin in any form. We verily believe that God has permitted this tongue delusion to be sprung upon the world today to draw a line between true and false professors. The writer is personally acquainted with a number of people who have been caught in this slime-pit and positively knows that they are without God and unwilling to make their crooked paths straight, and while they claim to be endued with the gifts of the Spirit, they are yet in “the gall of bitterness, and in the bond of iniquity” (Acts 8:23). They seek the gift of tongues on the same principle that Simon, the sorcerer, desired to have the apostles lay their hands on him in order that he might receive the gift of the Holy Ghost that he might work wonders. Our visitor told how he laid his hands on people and how wonderfully they were receiving their Pentecost. The devil has a substitute for the Holy Ghost baptism; he sends his agents through the country to confer his gift upon just such people as Simon, the sorcerer. If Simon had met Seymour instead of Peter he would have received the desire of his heart, that is, the counterfeit of the Holy Ghost. He wanted to show signs and wonders, without repenting of his wickedness, but he met the wrong person and after receiving a stinging rebuke he made a request for prayers, just the thing that the devotee of the tongue heresy did a few days ago, as he backed out of the office and bade us good day. New York Times; August 18, 1907; pg. SM2. "How They Jump, Where They Jump, When They Jump, Why They Jump, and Who They Are"
New York Times; December 11, 1910; p. SM7. "Holy Jumpers An Old Religion Headed By A Woman"
Christian Science Monitor; May 21, 1920; "The Pillar of Fire Mission. London, England. Mrs. Alma White, president of the American organization 'The Pillar of Fire,' which aims at curbing present tendencies in women's dress, and supports a 'dry' program, recently opened her ..."
New York Times; June 15, 1922; Letters to the Editor; p. 15. Letter from A. Stevens "May I suggest among the twelve greatest American women: Mother Lathrop of the Home for Sufferers and Bishop Alma White of the Pillar of Fire Church." New York Times; May 2, 1923; p. 1. "Bound Brook Mob Raids Klan Meeting: Thousand Hostile Citizens Surround Church and Lock In 100 Holy Rollers." New York Times; May 7, 1923; p. 15. "Armed Men Guard Services At Church: State Troopers at Pillar of Fire Temple While Bishop Alma White Preaches." New York Times; April 16, 1926; p. 21. "Woman Bishop Calls For Fashion Revolt: Head of Pillar of Fire Church, on Mission to England, Blames Men for 'Cruel' Styles." New York Times; August 25, 1928; p. 20. "Pillar of Fire Church in Camp." Chicago Tribune; October 10, 1928; p. 21. "Bishop Alma And Aimee May Do Some Spiritual Sparring"
Time magazine; October 22, 1928; "Poor Aimee. Aimee Semple McPherson [spoke] ... Worst of all, there came a rival female evangelist from New Jersey, a resolute woman with the mien of an inspired laundress — the Reverend "Bishop" Mrs. Mollie Alma White, founder and primate of the Pillar of Fire Church. Bishop White, who has thousands of disciples ("Holy Jumpers") in the British Isles, clearly regarded Mrs. McPherson as a poacher upon her preserves or worse. Squired by two male Deacons, the Reverend Bishop sat herself down in a box at Albert Hall with an air of purposing to break up the revival. The dread potency of Bishop White, when aroused against another female, may be judged from her scathing criticisms of the Church of Mary Baker Eddy: "The teachings of the so-called Christian Science Church ... have drawn multitudes from the orthodox faith, and blasted their hopes of heaven! ... A person who is thus in the grip of Satanic power is unable to extricate himself ... [and is] left in utter spiritual desolation." Well might buxom Aimee McPherson have quailed as she faced 2,000 tepid Britons, over 8,000 empty seats, the two Deacons and "Bishop" Mrs. White." New York Times; August 16, 1930; p. 13. "Pillar of Fire Bishop Back." New York Times; August 24, 1936; p. 10. "Revival Sect Hails Depression As Boon: Pillar of Fire Group's Founder, 74, Reports Peak of Prosperity to 1,200 at Meeting." Time; November 22, 1937; Legalists & Charismatics. "A woman, Mrs. Alma White, is bishop of the pentecostal Pillar of Fire church, in Zarephath, New Jersey"
Time magazine; November 22, 1937; Legalists & Charismatics. "A woman, Mrs. Alma White, is bishop of the pentecostal Pillar of Fire church, in Zarephath, New Jersey"
Time magazine; December 18, 1939; Bishop v. Drink. "'We've been over to Alma Temple and signed the pledge and joined the Dry Legion Crusaders. We shall never drink a drop, and when we're old enough we are going to vote the wicked stuff out of existence.' Author of these plays, written for radio and church performance, and acted last week on the platform in a church in Boulder, Colorado, was a masterful, mannish-voiced gynotheocrat, Bishop Alma White, 77. Once a Methodist, wife of a preacher, Mrs. White read herself out of her church because it frowned on her preaching. She founded a society of her own. That was nearly 40 years ago. Her church became known as the Pillar of Fire. Widowed, Mrs. White started a pious, shouting, camp-meeting community in New Jersey, named it Zarephath after the place where the 'widow woman' sustained Elijah. Alma White was soon acting like a bishop toward her flock; why should she not be "the first woman bishop in the history of the Christian church?" Pillar of Fire consecrated her as such in 1918. Indomitable Bishop White has built 49 churches, three colleges. She edits six magazines, travels continually between Zarephath and the West. She learned to drive an automobile at 50, to swim at 55, to paint in oils at 70. She has two radio stations, WAWZ at Zarephath, KPOF in Denver, where her Alma Temple is also a thriving concern. Her Prohibition plays, written with broadcasting in mind, had their premiere there. Her audience, recruited from Denver churches, thought them pillar-powerful, fiery-fierce." New York Times; June 27, 1946; p. 21. "Bishop Alma White, Preacher, Author: Founder of Pillar of Fire Dies at 84 - Established Several Schools and Colleges", "Bound Brook, New Jersey, June 26 (AP) Bishop Alma White, founder of the Pillar of Fire Church and author of thirty-five religious tracts and some 200 hymns, died here today at the headquarters of the religious group at near-by Zarephath. Her age was 84." Time magazine; July 8, 1946; Fundamentalist Pillar. "'Political parties yell themselves hoarse when the name of a nominee is mentioned. Why not shout in ecstasy when the name of the Lord is called? If you are happy, let the whole world know it. Do not keep your joy bottled up.' Fundamentalist ecstasy and hallelujah-shouting were a vital part of masterful, deep-voiced Alma White's faith. On it she built a sect called Pillar of Fire — with 4,000 followers, 61 churches, seven schools, ten periodicals and two broadcasting stations. Last week, as it must even to 'the only woman bishop in the world,' Death came to the Pillar of Fire's 84-year-old founder. No Catalepsy. Little Alma Bridwell was thought so dull by her Kentucky parents that they gave her ten brothers & sisters a priority on schooling. When an aunt invited one of the seven girls in the family to visit the wild Montana Territory, Alma was her last choice — but each of the others was afraid to venture into the country of cowboys & Indians. Nineteen-year-old Alma took the chance and stayed to teach, first in public school, later in Salt Lake City's Methodist seminary. When she wanted to preach as well, shocked Methodists told her to marry a preacher. At 25 she did. After marrying Methodist Minister Kent White, she occasionally took over his pulpit. But ecclesiastical authorities failed to share her congregation's enthusiasm for Mrs. White's preaching, and in 1901 she organized her own sect. Eventually Preacher White's followers took the name "Pillar of Fire" from the title of a bulletin she published. Though she believed in enthusiastic unbottling of religious emotions, Matriarch White was always stern with pentecostal excesses. "Sometimes our people get happy and skip around a bit," she said, "but . . . we don't have any catalepsy or epilepsy." When some of her southern followers once essayed a bit of holy rolling, Bishop White merely said, "You get right up or I'll stick a pin in you." It worked. No Female Bareleggedness. Her energy was prodigious. She wrote 35 religious tracts and some 200 hymns, wrote and produced two morality plays exposing the evils of drink. At 70 she took up painting, turned out 300-odd canvases, and had three New York exhibitions of her landscapes. During her last years she still fought her good fight against cardplaying and female bareleggedness (because of the "spinelessness" of men). Last week, at Pillar of Fire's thousand-acre colony in New Jersey (named Zarephath after the place where the "widow woman" sustained Elijah), Alma White's son carried on. Handsome, scholarly Arthur K. White, also a bishop, said that this summer he might propose a candidate for Pillar of Fire's No. 2 bishopric." New York Times; November 6, 1946; p. 22. "Ray Bridwell White; Pillar of Fire Church Leader, Son of Late Bishop, Dies." New York Times; August 23, 1950; p. 33. "2,000 Revivalists Gather in New Jersey As Pillar of Fire Meeting Nears Climax." New York Times; March 16, 1964; p. 24. "Pillar of Fire Bishop Marks 75th Birthday in Jersey." New York Times; August 24, 1975; p. 60. "Faithful Savor Rural Life"
New York Times; September 18, 1981; p. D15. "Bishop Arthur White, 92, Dies; Headed Pillar of Fire Church. Bishop Arthur K. White, president and general superintendent of the Pillar of Fire Church in Zarephath, New Jersey, died Monday at his home in Zarephath. He was 92 years old.